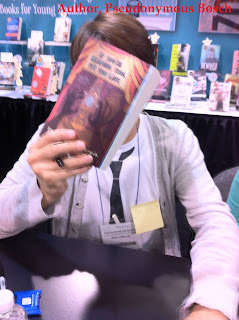 I had a blast at ALA. I was kept busy from the time that I landed on Friday, June 22nd until I left for my vacation on Tuesday, June 26th. I began my Anaheim adventure by having lunch with a former student who I had not seen since she graduated high school in 2003. She was in first grade when I first became a librarian, and now at 28 she hopes to illustrate children's picture books. 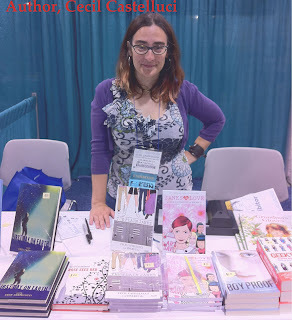 I sure hope that she can find a way to fulfill her dream and maybe some day I will be standing in line for her to sign her book at ALA.
One of the things that I like to do most at ALA is get some face to face time with many of the authors that I enjoy reading. It was really cool that I got to meet three authors with whom the students at Patrick Taylor had communicated with through Skype. 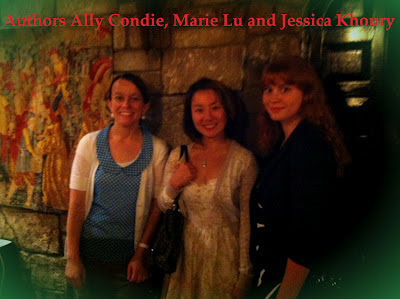 Here are some of the authors that I had a chance to meet. All of them were delightful and took the time to chat with me. On the first night I went to a dinner hosted by Penguin for three dystopian queens: Ally Condie who wrote the Match trilogy, Marie Lu author of the Legend trilogy and first time author, Jessica Khoury, who's book Origin comes out in September. I have read Matched and Crossed and loved the world that Condie created. Yes, it has one of those love triangles that seem so ubiquitous these days, but it is a well written story and the characters ring true. I liked the first one better, but I will be in line to buy Reached as soon as it is released in November. I read Lu's Legend in anticipation of meeting her. I liked the two points of view from June and Day. What I didn't like was the light green ink used for Day. It was so hard to read in low light. Luckily in Prodigy, which I read on the plane ride home, they used blue ink for Day which was much easier on the eyes. Prodigy won't be released until January of 2013, so it is going to be a long time before I find out what happens in the third and last installment. I am waiting for Origin to arrive in the box that I shipped home, but I am anxious to see what this newcomer has to offer. In the exhibit hall there were signings all day every day by authors and illustrators of books for children, young adults, and adults. One of the first authors that I met was Janet Tashjian. She wrote the wonderful Larry series, but her newest book is called, For What it's Worth. I just happened to read it before going to Anaheim. The main character in the book, Quinn, is the exact age that I was in 1971. So all the music and popular culture references were very familiar to me. This is Michael Grant. He wrote the Gone series that so many of the Taylor kids have gone crazy over. His newest work is BZRK. Check out the website for the book here. Pseudonymous Bosch, pen name of author, wrote the Secret series, a humorous mystery adventure series perfect for middle school readers. 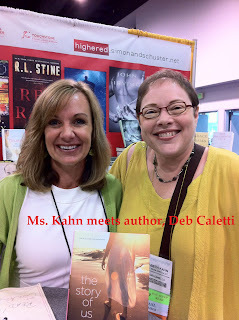 I have been a Deb Caletti fan for years now. Her Honey, Baby, Sweetheart is one of my favorite realistic fiction stories. Her newest title, The Story of Us, is also in the box that I shipped home. I didn't want to carry a hard back on the plane. I really enjoyed chatting with Deb. She lives in the Pacific Northwest, but I hope that she makes a trek south sometime so she can visit Patrick Taylor. I know that the kids would really enjoy meeting her. As I turned the corner in the exhibit hall, I found the artist's alley. I was so surprised to see Cecil Castellucci manning her own table. She had skyped with Bookmarked in March. I loved having the opportunity to meet someone face to face who I met via Skype. 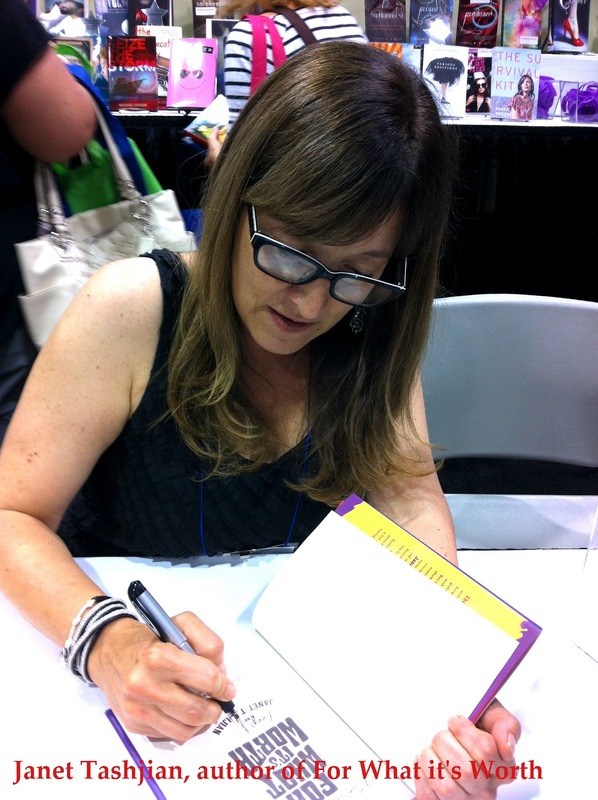 I got a signed copy of her new book for the library, Year of the Beasts. 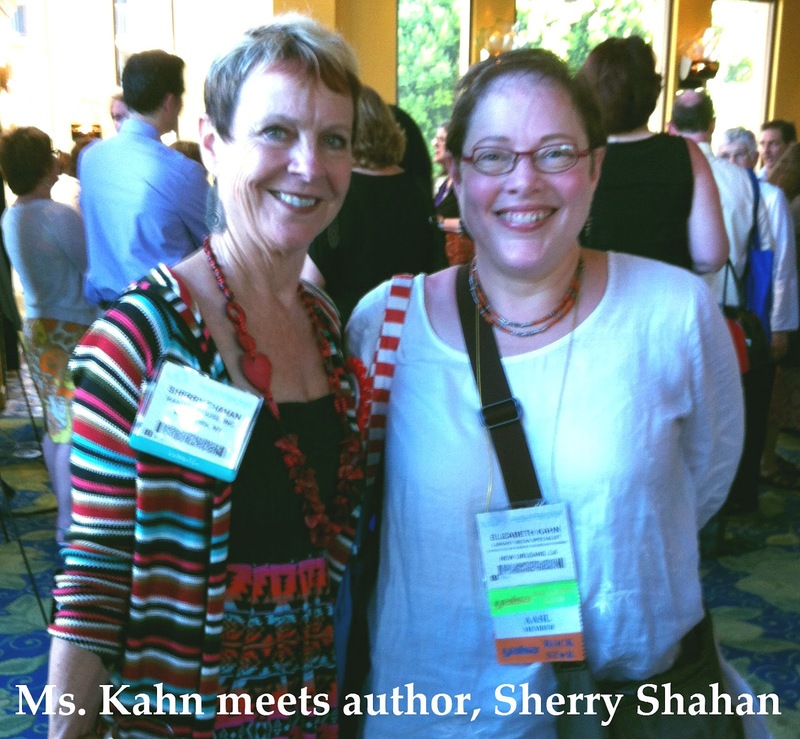 In May, BRiMS, skyped with author, Sherry Shahan. I knew that she lived in southern California and asked if she was going to be at ALA. We met up at a party hosted by Random House. She was delightful and offered to skype with Bookmarked to talk about her young adult title, Purple Daze. 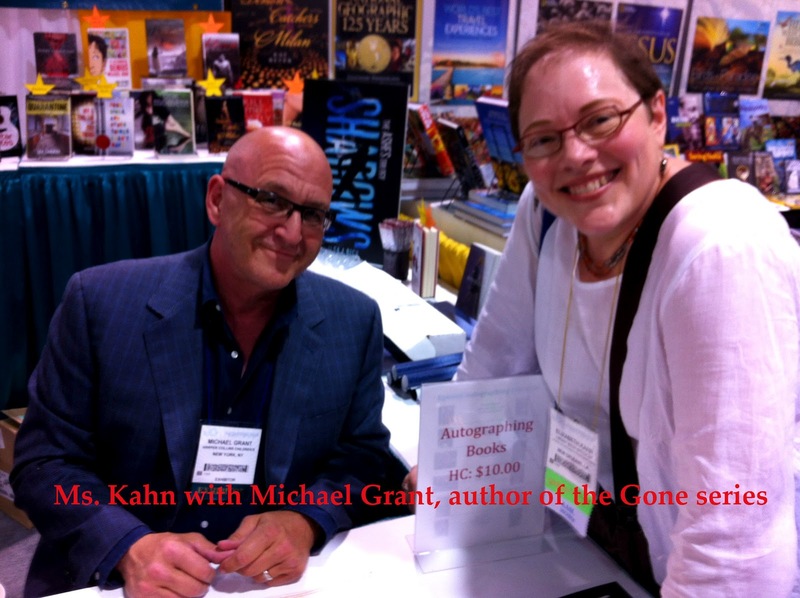 There were so many more authors with whom I got to chat, but I think this gives you an idea of my ALA experience.